Food Safety is a peer-reviewed open-access electronic online journal of English published quarterly by the Food Safety Commission of Japan (FSCJ). Since the first issue was published in December of 2013, this journal has been regularly published on broad fields of sciences on food-related risk assessments. The aim of the publication of Food Safety is to gather and disseminate scientific and technological information in the field of food safety on human health, and thereby facilitate the development of science and technology for risk assessments of foods. The journal publishes original articles, short communications, and reviews covering broad areas of food safety related to the risk assessment of foods as well as risk assessments conducted by FSCJ. The scope of Food Safety covers: (1) pathogenicity or toxicity of biological, physical, or chemical agents concerning food safety; (2) occurrence of biological, physical, or chemical agents in the food chain with emphasis on food safety; (3) epidemiology or control of food-borne illnesses; and (4) safety evaluation of novel foods including nanomaterials, genetically modified organisms, etc. In addition to these areas, papers on the methodology of risk assessments concerning food safety are encouraged. We are grateful to the contributors for supporting the publication of the journal, which will advance the development of science and technology for food safety. This journal is assigned to Digital Object Identifier (DOI)-Cross Reference. A major corn-related mycotoxin, fumonisin B1 (FB1), continues to attract attention of researchers as well as risk-assessors due to the diverse toxicological characteristics, including distinct target tissues in different animal species and opposite susceptibility in males and females in mice and rats. More than thirty years passed since the structure identification as a sphingoid-like chemical, but the causal mechanism of the toxicity remains obscure in spites of extensive studies. Considerable amounts of knowledge have been accumulated on the biochemical/toxicological actions of FB1, but the influence on lipid dynamics and mobilization in the body has not been focused well in relation to the FB1-mediated toxicity. 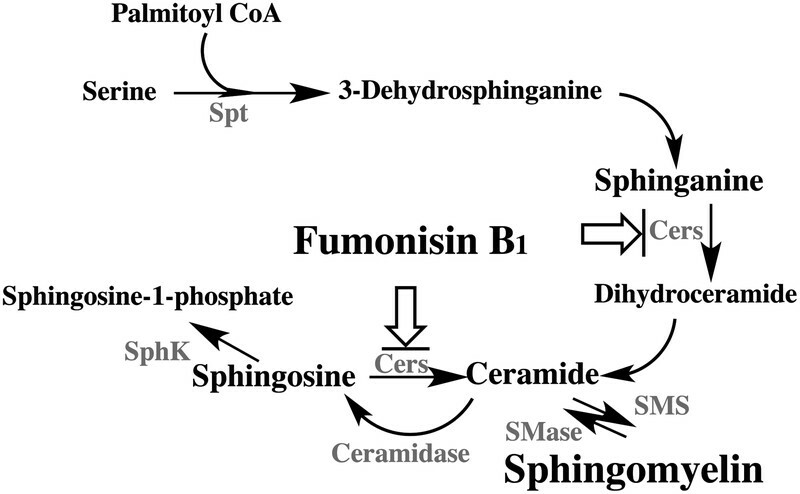 Considerable influences of this toxin on mobilization of sphingolipids and phospholipids and also on adaptive changes in their compositions in tissues are implicated from recent studies on FB1-interacting ceramide synthases. Accumulated patho-physiological data also suggest a possible role of hepatic phospholipid on FB1-mediated toxicity. Thus, a mechanism of FB1-mediated toxicity is discussed in relation to the mobilization of phospholipids and sphingolipids in the body in this context.